Iran is building a two-unit nuclear plant, Bushehr-II, which is designed to add 1.8 GW of nuclear capacity when completed in about 2026. 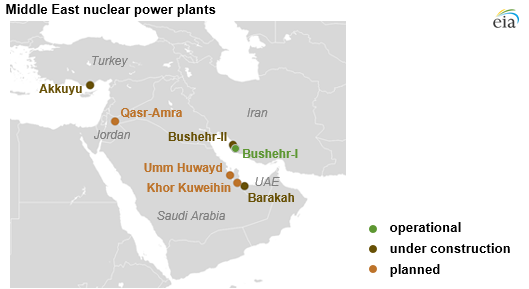 Iran’s original Bushehr-I facility, which came online in 2011, was the first nuclear power plant in the Middle East. Bushehr-I has one 1.0 GW reactor unit producing about 5.9 million kWh of electricity per year. Turkey began construction of the Akkuyu nuclear power plant in late 2017. Akkuyu is a four-unit facility designed to add 4.8 GW of nuclear capacity to Turkey’s generation mix. The first reactor unit is scheduled to be completed by 2025. Jordan plans to install a two-unit 2.0 GW nuclear plant and has been conducting nuclear feasibility studies with Russia’s Rosatom since 2016. In early 2017, Jordan solicited bids for supplying turbines and electrical systems, and construction is expected to begin in 2019 and to be completed by 2024. 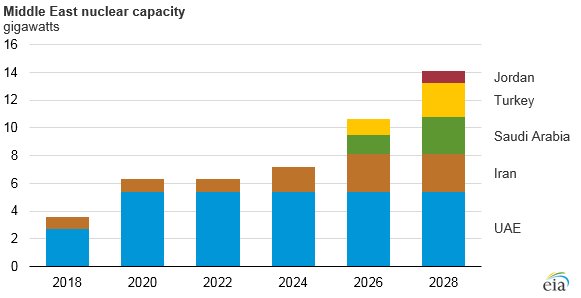 More information about Middle East nuclear capacity projections is available in EIA’s International Energy Outlook 2017.